On July 18, 2015 thousands of Georgians gathered in Tbilisi protesting Russia’s “creeping occupation” as South Ossetia based Russian troops continue to draw the border along the Administrative Border Line between Georgia and the occupied territory of South Ossetia. The unresolved territorial conflicts over South Ossetia, Abkhazia, and Nagorno-Karabakh are major sources of instability in the South Caucasus. These conflicts are often referred to as ticking bombs, and despite numerous common challenges, the region is claimed to be “more divided than united” mainly because of these conflicts and because of the competing interests of regional powers – Russia, Turkey and Iran. All three South Caucasian states have different political relations with these states and towards the West. In 2013, CRRC’s Caucasus Barometer survey asked the populations of the countries of the South Caucasus about their opinions on the territorial disputes in their own and in neighbouring countries – namely, the conflicts over Abkhazia and Nagorno-Karabakh. This blog post looks at the findings. Assuming that the population of each country was informed about the conflict in their own country, the populations of Armenia and Azerbaijan were asked if they had heard about the conflict in Abkhazia, while the population in Georgia was asked if they had heard about the conflict in Nagorno-Karabakh. Only those who reported having heard about these conflicts were asked follow-up questions. The data shows that a larger share of the Georgian population has heard about the conflict in Nagorno-Karabakh (62%) compared to the shares of the populations of Armenia and Azerbaijan that have heard about the conflict in Abkhazia (49% and 43% respectively). In respect to each conflict, questions about potential solutions were asked. Speaking about Armenians’ attitudes towards possible solutions of the conflict in Abkhazia, Armenians most commonly think Abkhazia should be an independent country (46%). The next most commonly held view was that Abkhazia should be a part of Russia (26%). Only 7% of Armenians would favor Abkhazia as a part of Georgia. Note: The question was asked to the 49% of Armenians who reported having heard about the conflict in Abkhazia. In contrast, the Azerbaijani public most commonly would favor having Abkhazia as a formal part of Georgia (77%) and 12% would support the idea of having Abkhazia as an independent country. Less than 1% would favor having it as a formal part of Russia. Note: The question was asked to the 43% of Azerbaijanis who reported having heard about the conflict in Abkhazia. The Georgian population is overwhelmingly in favor of having Abkhazia as a formal part of Georgia without autonomy (73%), and 33% believe it should have a high degree of autonomy within Georgia. Only 3% favors Abkhazia as an independent country. 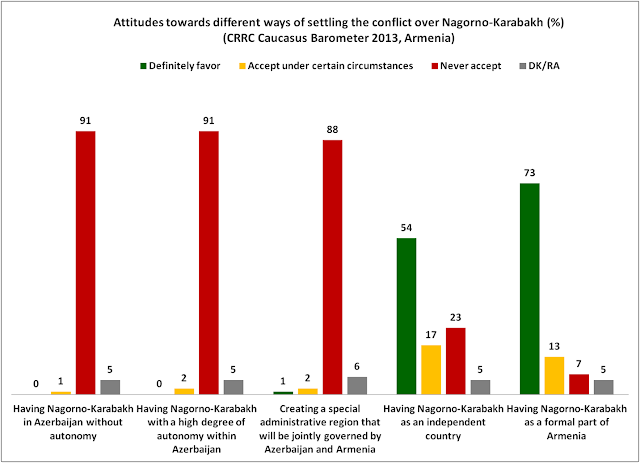 The opinions over the conflict of Nagorno-Karabakh differ across the countries as well. Given that Armenia and Azerbaijan are the two sides involved in the Nagorno-Karabakh conflict, it is unsurprising that the populations of these countries express radically different opinions about the possible future of this conflict. Armenians most commonly would favor having Nagorno-Karabakh as a formal part of Armenia (73%). More than half (54%) would also favor having it as an independent country, but would find it absolutely unacceptable for Nagorno-Karabakh to be a part of Azerbaijan. The absolute majority (95%) of Azerbaijanis would favor having Nagorno-Karabakh as a formal part of Azerbaijan. Notably less – only about a third of the population – would favor the scenario of having Nagorno-Karabakh with a high degree of autonomy within Azerbaijan. Unlike Armenians, Azerbaijanis do not at all favor having Nagorno-Karabakh as an independent country. 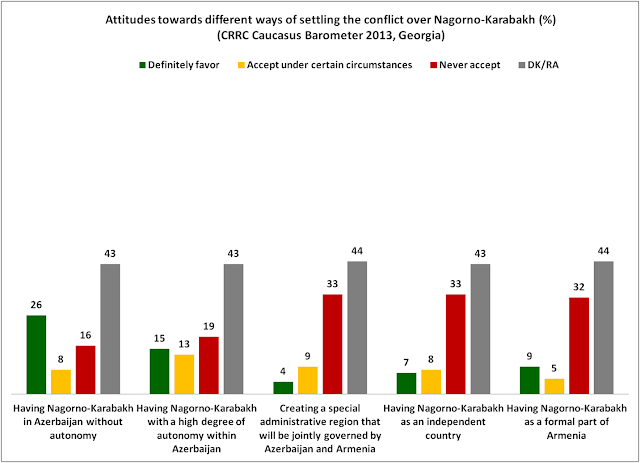 As for the Georgian public’s attitudes towards possible solutions of the conflict over Nagorno-Karabakh, slightly less than half of Georgians who reported they have heard about this conflict either could not answer the questions about the future status of this territory, or refused to answer the questions. As for the rest, more people would favor having Nagorno-Karabakh as a formal part of Azerbaijan (26%) than of Armenia (9%). 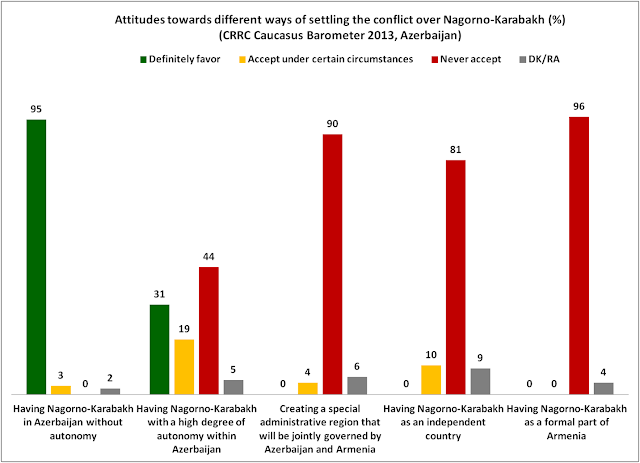 Note: The question was asked to the 62% of Georgians who reported to have known about the conflict in Nagorno-Karabakh. 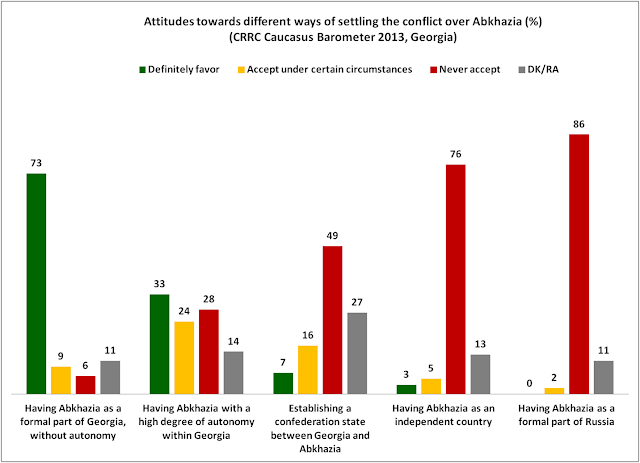 This blog post looked at how public opinion on territorial conflicts in the region varies across the South Caucasian states. Overall, Georgian and Azerbaijani public opinion on the preferences about the future of Abkhazia is more similar than the public opinion in Armenia. 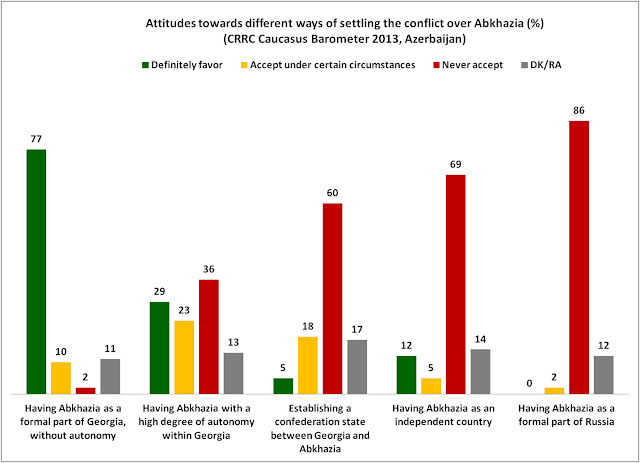 As the opinions over the status of Nagorno-Karabakh, Azerbaijani public attitudes are sharper than the attitudes of Armenians, while Georgians largely avoid reporting their opinions, or do not have any. Yet, notably more Georgians which do have opinions about the possible solution of the conflict in Nagorno-Karabakh are in favor of having Nagorno-Karabakh as a formal part of Azerbaijan than of having it as a formal part of Armenia. Considering the geopolitical realities, these findings are not surprising. Georgia and Azerbaijan are in a quite similar situation, as both have lost territories, while Armenia de-facto controls Nagorno-Karabakh with Russia’s support. As Svante Cornell et al. (2005) argue in their work on South Caucasian conflicts, the conflict in Abkhazia has the same symbolic importance for Georgia as the conflict in Nagorno-Karabakh has for Azerbaijan, as both countries were defeated in these conflicts against a numerically much smaller enemy relying on external support, while Armenia feels less urgency to find a solution and is interested in preserving the military status quo. 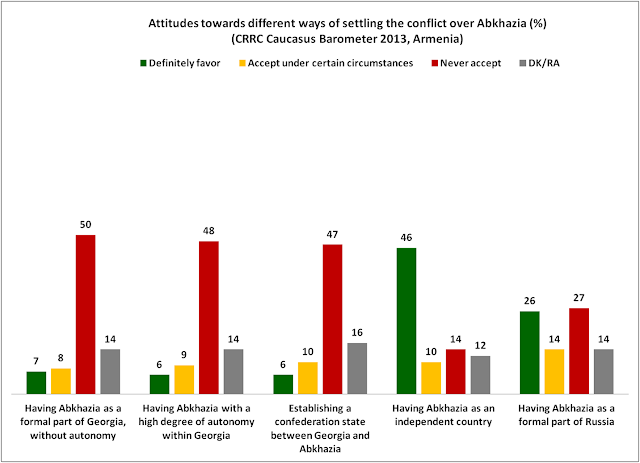 To learn more about public opinion on the conflicts in the South Caucasus, take a look at CRRC’s earlier blog posts, When is a war not a war?, Nagorno-Karabakh: Prospects for difficult reconciliation (Armenia) and Engagement without recognition? and check out our Online Data Analysis platform.